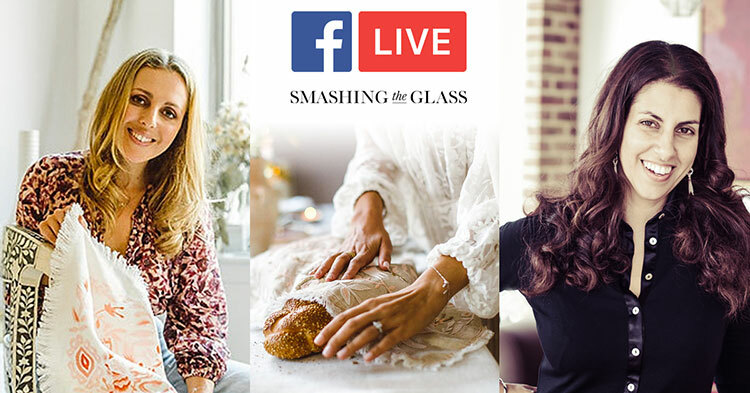 This Monday July 2, we are going live with the incredible Micaela Ezra, founder of AHYIN, to talk about how to incorporate Jewish spirituality into your wedding and home. 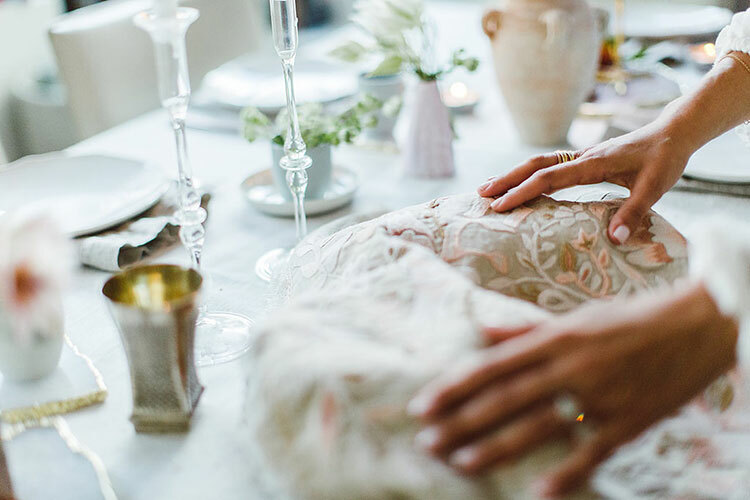 As brides, we spend so much time thinking about the aesthetics and logistics of our big days, sometimes it’s easy to overlook the spiritual element of your Jewish (or Jew-ish) wedding — and of the home you’re building together. 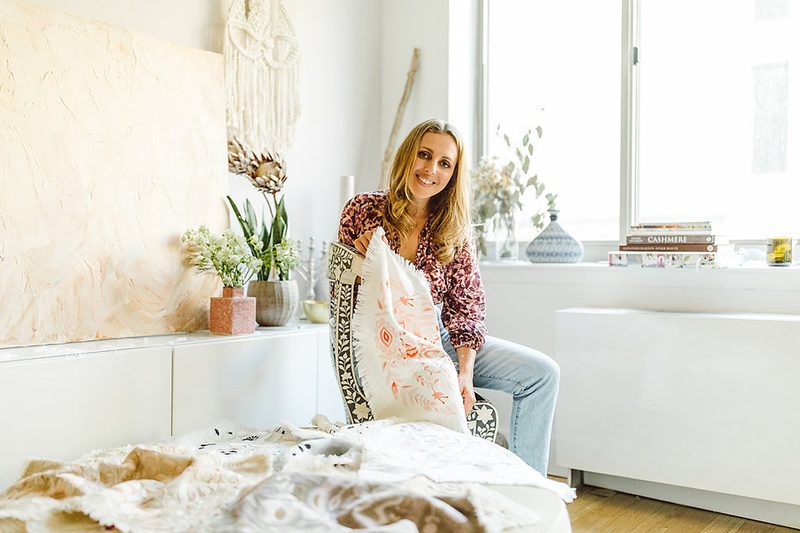 That’s why I’m SO thrilled to be going live with NYC-based Micaela Ezra, the powerhouse designer behind AHYIN, a jaw-droppingly gorgeous line of contemporary Judaica that we on Team STG are absolutely OBSESSED with. There’ll also be an exclusive gift from Micaela for everyone who watches… you won’t want to miss this! 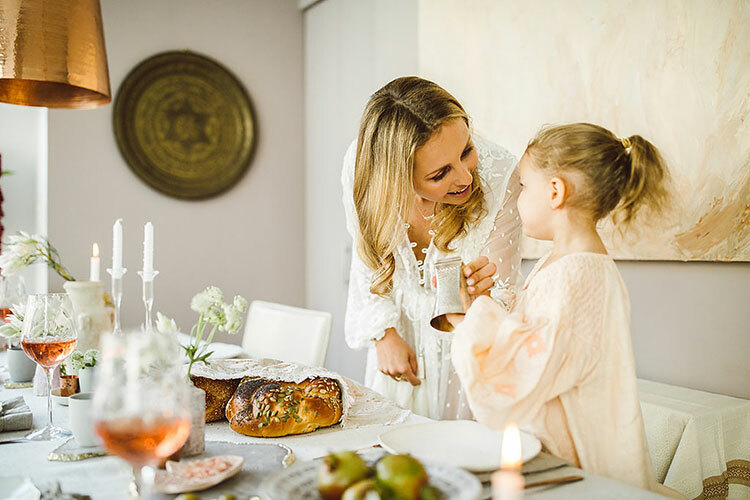 As brides, we spend so much time thinking about the aesthetics and logistics of our big days, sometimes it’s easy to overlook the spiritual element of your Jewish (or Jew-ish) wedding – and of the home you’re building together. That’s why I’m so thrilled to be talking today to Micaela Ezra, the powerhouse designer behind AHYIN, a jawdroppingly gorgeous line of contemporary Judaica that we on Team STG are absolutely in love with. 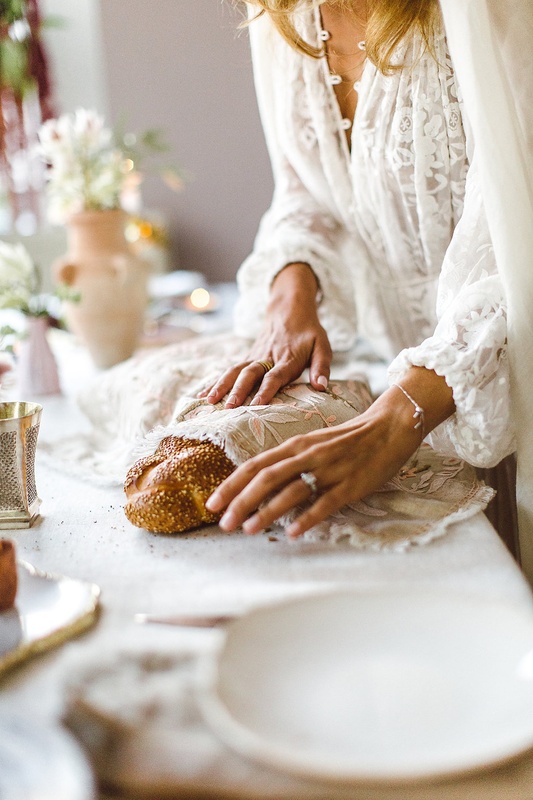 Micaela’s designs – she’s best known for her stunning challah covers, which bring together traditional Jewish symbolism and the embroidery traditions of the craftswomen of Hilando Mexico, a collective whose members hand-embroider each and every AHYIN piece. 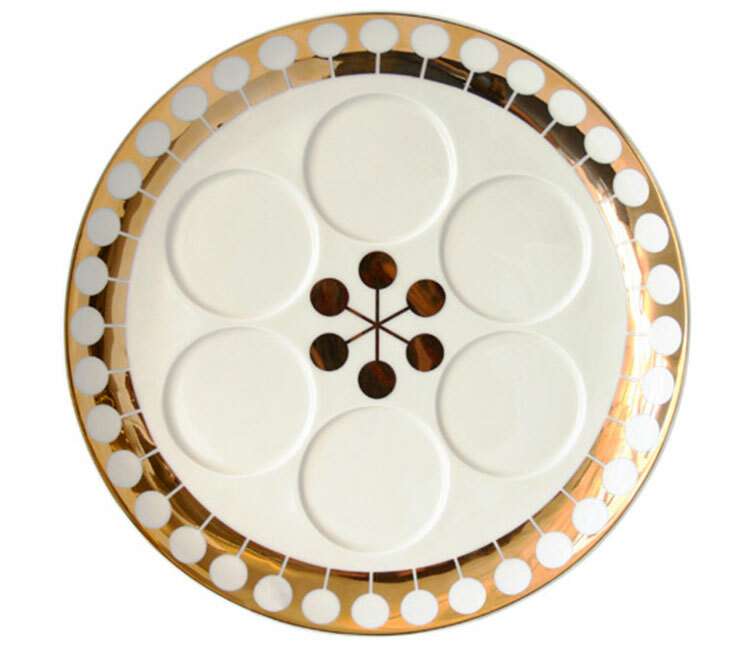 Meant to start conversation around the Friday night dinner table, Micaela’s designs reflect her belief in the relevance of Jewish ritual to our contemporary lives, and equally in the fusion of spirituality and beauty. 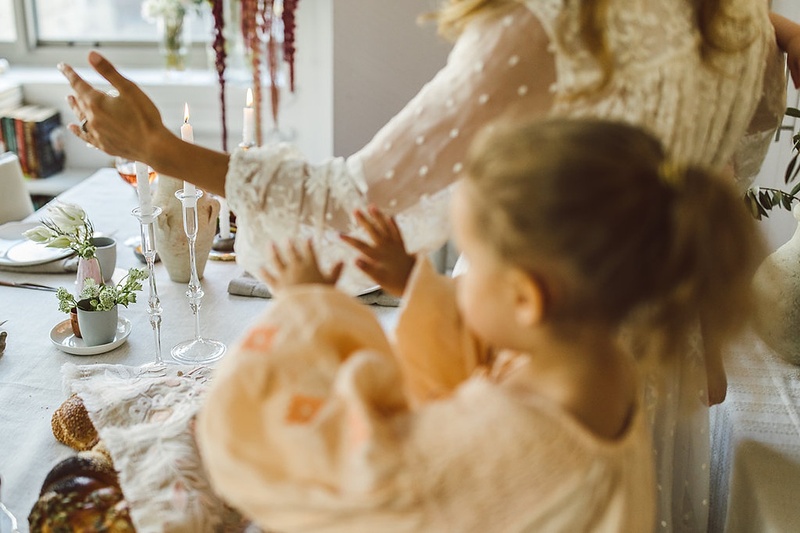 AHYIN’s pieces are intended to be handed down through the generations as heirlooms, and what a beautiful symbol of the beginning of your life together as a family. Even for those of us who are not exactly at the beginning of our lives together – I know I’m adding a few of these beauties to my own wishlist! 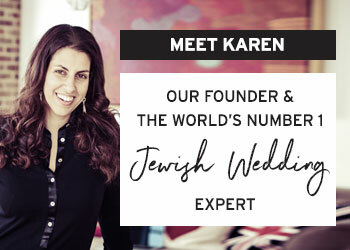 What makes Micaela so inspiring is that she really embodies her commitment to tradition and modernity, ritual and aesthetic, not only in her work but also in her life – as she detailed when talking to us about everything from her journey from fashion design to Judaica to how she incorporated spirituality into her own wedding. There’s so much more I could say about this fantastic lady and her art, but I’ll let you read it in her own words. STG: What inspired you to create AHYIN? Micaela Ezra: Actually a childhood friend from Australia asked me to design her a challah cover in the traditional Mexican Otami embroidery style (I am a designer and artist). The request prompted a creative journey into an industry I had never even considered. I serendipitously came across a community of talented artisans in Mexico and suddenly I realised that this work was the meeting point of so many life passions for me – textile design, Jewish spirituality and social change philanthropy. 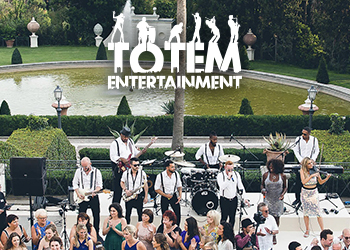 If you’re unsure whether to have a wedding list, let me tell you, from experience, you really do need one. Your friends and family will WANT to buy you a gift to show the love. But unless you direct them, you’re in danger of receiving presents that are either too chintzy or a tad off piste. Without a list you could be the proud recipient of something you already have or ever worse – never ever want to have. And hot off the press, I can reveal that the truly stunning Graham and Green and Soho Home (my absolute faves!) have recently just added themselves to that illustrious list. So it’s not without reason that Prezola is now the UK’s favourite independent (multi award-winning) wedding gift list and honeymoon fund. I would have LOVED to have known about Prezola when I got married. It’s such a beautifully curated site with the most gorgeous selection of homewares I’ve seen in one place. It feels so hand picked whether your style is urban and cool or pretty and rustic, glamorous and shiny. And they’re SUCH a lovely company to work with. They’re one of my favourite STG finds and in fact I’ve already made a dream list with them. 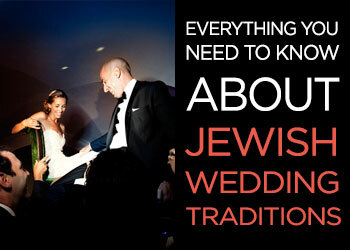 Hugely exciting news is that Prezola now caters specifically for Jewish weddings. Alongside the perfect modern gifts (30,000 to be exact), they now also offer the more traditional Judaica style gifts that relatives just LOVE to buy you. But get this, with brands like Alessi and the fabulous Jonathan Adler, Prezola now have traditional gifts with a modern twist. So STG! A wedding list is a beautiful thing — it allows you to let people know exactly what you want without the embarrassment of actually telling them personally. For an engagement present, a beloved aunt bought me and Mr. STG a challah cover, which lets say, left a lot to be desired in terms of design. It now spends its life in the messy drawer in our kitchen. If I had a list at Prezola, I could have chosen a more ‘us’ traditional gift and not feel guilty every time I catch a glimpse of that lavishly embroidered cover. I love tradition but I also love design. Who says I cant have both? 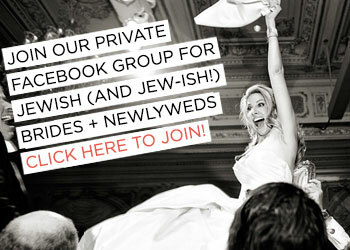 To see all their fabulous Judaica, click here. If you’ve already set up home, it’s especially important to have a wedding list. You simply don’t need two toasters. And the best part is that you can browse and go a little wild. You know those things that you possibly wouldn’t have bought when you had your sensible head on. 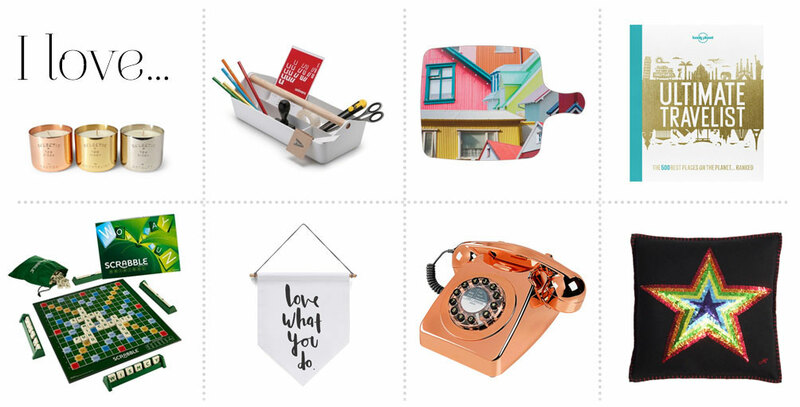 Prezola’s list lets you get the big stuff — think gorgeous linens and stunning cookware, but also the fun, cool additions to your home. Being on both the giving and receiving end of this conversation numerous times, I love wedding registries! They make wedding gift shopping so easy for a guest and eliminate that dreaded question, “What do you want for your wedding?” for the bride. and groom It can be extremely awkward to ask for specific items, especially if they are on the more expensive side, but the wedding registry allows your guests to see exactly what it is that you and your partner want or need as you begin to build your new lives together while being able to stay on their own personal budget. You’ve Got to Start Somewhere! As with most wedding planning aspects, building your registry can be both fun and a bit stressful. You may find that you and your fiancà©(e) value different things, and who knew that you’re actually supposed to register for a certain number of gifts at different price points based on the number of guests you’re having?! We decided it would be best to register at two stores with a nation-wide presence because it would give our guests options and would make things simpler for those who are coming from out-of-town. We also knew not to limit this process to one day because it can easily become overwhelming. 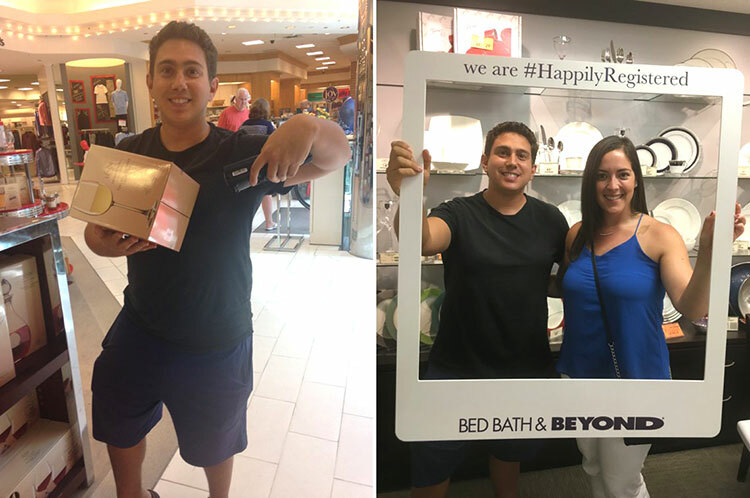 Many stores that offer a wedding registry service, including the two we used (Macy’s and Bed, Bath, and Beyond) do a great job or providing Wedding Registry Guides/Checklists and a personal shopping assistant to help you through the process. 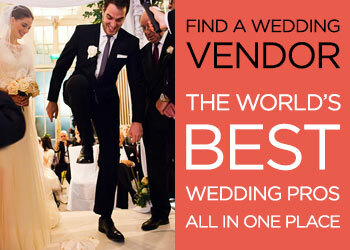 They definitely alleviate some of the stress that comes with an afternoon full of decision-making by offering information about best sellers and items that typically are left on the registry, as well as those items that you may think are necessary but usually end up getting returned after the wedding. They also do fun events and promotions to get couples excited about registering, such as Macy’s “Sip and Scan” event where Harley and I won two nights at the Palm Beach Gardens Marriott. We’re saving it until after the wedding, so we still have a staycation to look forward to! In 1984, the same year Miami Vice premiered on American TV and Frankie Goes to Hollywood was getting us all to ‘RELAX’, I was a 13 year old Bat Mitzvah. I spent almost every other weekend that year attending another friends’s Bat Mitzvah, and sneaking out of her service to peruse the temple’s Judaica collection. I was a budding artist and designer on a search for objects that were new, clever, modern and inspiring. Would there be anything in those vitrines that I’d like to see on my holiday or Shabbat table? 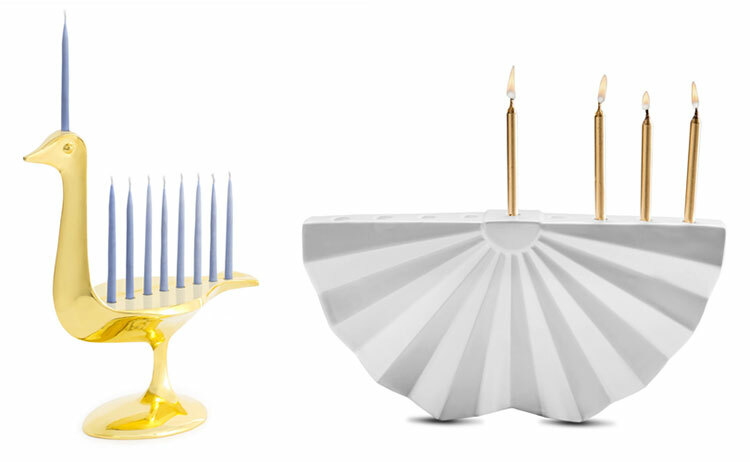 Where were the warm, modern, tasteful menorahs, seder plates, and kiddush cups for design-savvy Jewish girls like me? 32 years later I’m still asking the same question. 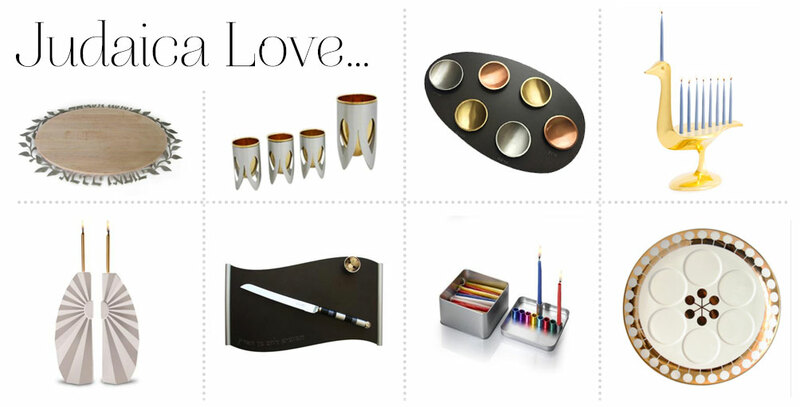 Stylish Modern Judaica. Does it really exist? 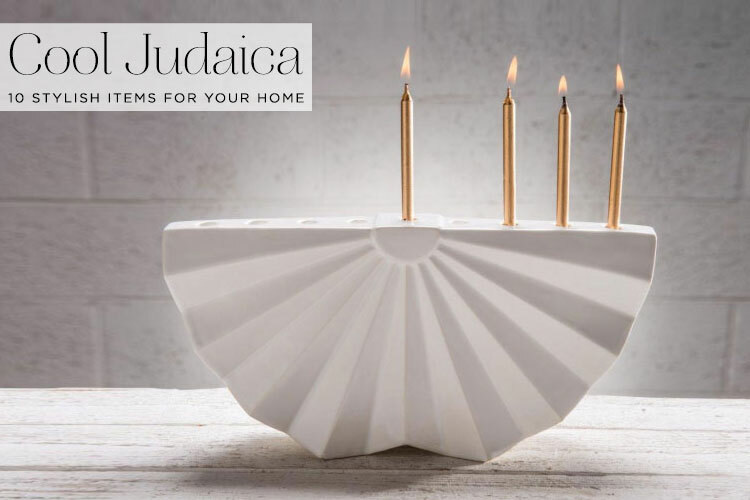 There are many talented Judaic artists working today, but there is still limited contemporary Judaica available that reflects the tastes of young, modern, urban, assimilated Jews. However, there are a handful of Judaic pieces that would bring me joy to have in my home–works that reflect my personal style and aren’t a throwback to the 1980s (or 1880s). Any of them would also make an excellent wedding gift. 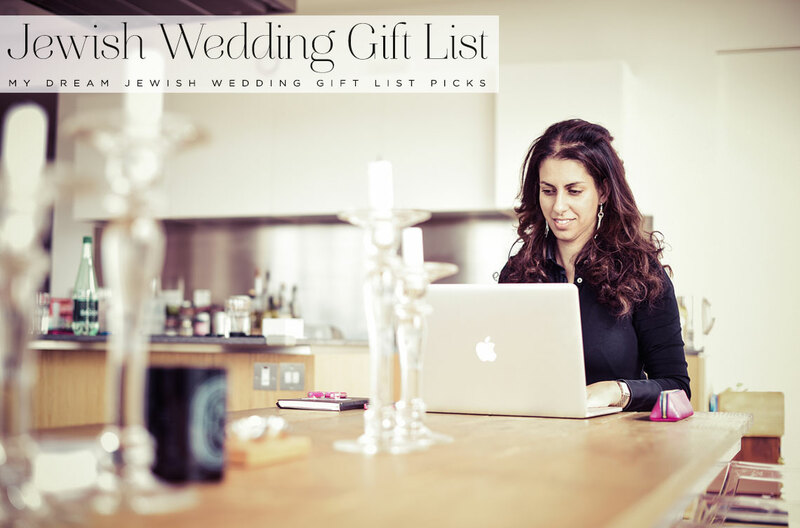 So here are my top 10 picks for my favourite modern Judaica, with links to where you can find them.